I met the couple behind Noble & Wild at a wine tasting in Bristol in 2016. 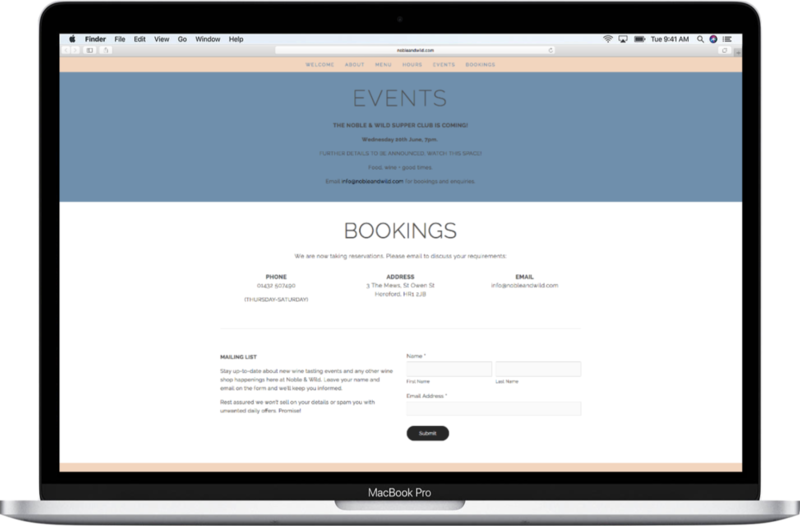 Taken by their plans to open an enoteca in Hereford, I offered to build their website. Seonaid and Theo Bulmer don’t do things by half. Their excellent taste and uncompromising attention to detail led them to create a very beautiful wine bar and bottle shop, up there with some of the country’s best. The challenge was conveying the essence of Noble & Wild – the hand-picked wines, unfussy food and laid back atmosphere – while explaining the enoteca concept. As well as designing the website, I also took the photographs.